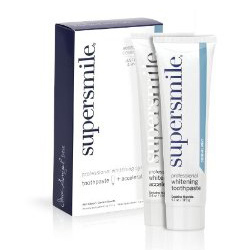 Supersmile Teeth Whitening System was created by Dr. Irwin Smigel who is renowned as the father of aesthetic dentistry.His teeth whitening product claims it can remove stains like coffee, tea, tobacco, red wines, smoking stains and any plaque. Unlike other teeth home whitening kits which require messy trays and significant time to bleach your teeth, with Supersmile you simply brush with the two products twice a day for about 2 minutes. Most people notice changes to their teeth between 3-5 days, however some may take longer. The secret to Supersmile is Calprox which breaks down protein pellicle, which most stains adhere to, causing discoloring of your teeth. One thing we like most about the product is you can use it with any electric toothbrush or you can buy the Supersmile electric toothbrush. Pricing wise, this product is exception for a teeth whitening product compare to the thousands you can expect to pay at any professional teeth whitening service. With your help we can reach more people and let them know about Supersmile Teeth Whitening whether this product works or not. I absolutely love this product and I've been using in for years. I have veneers on my front teeth. I drink alot of coffee & supersmile is the only things that works for me. And my smile is bright!